Hey Everyone, here is another attempt at cooking! There is a group of ladies at work that I adore, and every so often we try to spice up lunch time by planning a potluck. We usually have themes and this time it was breakfast/brunch. I got this recipe off Lick My Spoon, which happens to be one of my favorite blogs. Steph's photos are beautiful, she writes about different topics and I like her writing style. She made this for a ski trip, and I thought it was easy and looked yummy. Spread the cream cheese on both sides of the bread. Place in a greased 13×9 inch baking pan. Whisk remaining ingredients together and pour over bread. Sprinkle cinnamon on top, cover, and refrigerate overnight. Sprinkle chopped pecans on top and bake for about 20 minutes at 400 degrees until puffy and set. I couldn't find Texas Toast so I used Challah bread. I didn't let it sit over night because I was in a hurry, so I don't know if that affected the turnout. I didn't know how much cinnamon to put in, so I actually didn't put enough (lesson learned). Also, I used lite syrup and fat free milk, which I think I'll substitute for the 'real stuff' next time. Thankfully everyone enjoyed it anyway! Great recipe and I know what I need to do differently next time! Kickin' off the summer this weekend!! 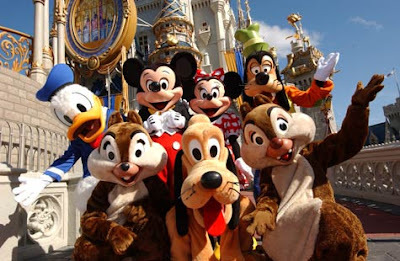 For Memorial Weekend (and some days after) I'll be in Orlando, FL in Disney World, woo hoo vacation! I haven't been back since I was maybe 9 years old? I'll make sure to take a ton of pics, and I'll try my best to document what we're eating in case you all decide to visit for yourselves. I have one post scheduled to publish while I'm gone too. Hi Everyone! This time for me and my dad's bi-weekly lunch we walked around Downtown Bethesda and randomly picked a place to eat. We stumbled upon Bangkok Garden and decided to give it a shot. There are street meters and a metered parking garage that services St. Elmo St and Cordell Ave, which is where we parked because it's easy than driving around looking for a car to leave. The closest Metro station would be Bethesda on the Red line. I didn't notice at the time, but the store front is very colorful! They have awards displayed in their windows as well. The place was pretty big, I believe there was another room in the back that I could see briefly as I was walking in. There are a ton of traditional Thai decorations and a wall in tribute of the Thai king and queen. We were the 1st people in there when it opened, but more people quickly poured in. The menu contained many typical Thai dishes (Pad Thai, Curries, etc), as well as meat and vegetarian options that can be cooked with different flavors and levels of spiciness. They have their own list of Specialties that include Soft Shell Crab dishes and Duck Curry. For our appetizer we ordered the 'Thai Style Salad with Shrimp and Chicken' for $7.50. It was a good portion of food that I had to take home later since I didn't want to ruin my appetite. I liked the dressing it came with because it wasn't overpowering. My dad ordered the 'Squid with Hot Chili Peppers' for $13.50. He said he liked it and when I tried it I thought it was good too. It wasn't too spicy, and the squid was cooked well because it wasn't overly chewy. A bowl of white rice was given for the both of us to share. I ordered my FAVORITE Thai curry, which is 'Penang Curry' for $11.95. You have options like chicken, beef, pork, shrimp, vegetables, or tofu. I always order the tofu (my cousin introduced this dish to me) because it soaks in the curry the best. Both the squid and curry dishes were labeled as 'Medium Hot' however the squid was more mild. Overall the lunch was great. The staff was really nice and attentive. There is a lot of choices on the menu to suit your mood. The prices are comparable to other Thai places I've eaten at in the area, and there is enough food to bring home. Hi everyone! Mother's Day had just past, so my cousins and our friend made dinner for my aunt. I find myself cooking on holidays and for potlucks only, but its been more than I have ever done before, so I'm feeling good about it. Isn't the table so cute and girly? My cousin made Chicken Adobo. I have never had it before, but it was really good and she said it was easy to make. I decided to make Bobby Flay's Fresh Mozzarella with Red and Yellow Tomatoes and Basil Vinaigrette. OMG, its a fabulous recipe. The colors and flavors are really fresh and tangy. I will definitely make this again because it was so easy. Arrange the cheese and tomatoes on a platter and drizzle with the vinaigrette, to taste, and garnish with basil leaves. We were being healthier and ate our meal with brown rice instead of white. My aunt brought a fruit salad for us which was really refreshing! Hope all the Mom's out there were pampered like y'all should be! Since my mom doesn't live in the area she wasn't able to be at dinner, however I love her a ton and can't wait to see her in October! The same night the bf and I had dinner at Nando's Peri Peri, we all decided to get frozen yogurt at Mr. Yogato. What a cool name!! It's another tangy frozen yogurt that has been springing up around the area, like YogiBerry in Rockville. There is limited street parking around the place, but it's a couple blocks away from Dupont Metro station on the Red Line. This is what it looks like on the outside. It's in one of the older buildings in Dupont, which I like because it gives it character. The place is TINY. You're seeing the entire thing because we were sitting at the table next to the window. Seating is very limited and sometimes child-sized. Here's the view from the other side of the place. It reminds me of a children's dental office with small tables, painted walls, and games. There was a couple playing on an original Nintendo. They have one register and a small back kitchen. So as you can see from the 1st picture of the interior, the line can get a bit long. What I liked about this place was that it was cheaper than YogiBerry. They have 2 standard flavors (original soft, original tangy) and 2 weekly ones (cosmé-granate, saori's choco-delicious were the flavors when we went). They like to have fun at this place. You can get discounts on your orders if you can complete any of the items on the 'Rules of Yogato' list. How cool would that be to have a flavor named after you?! The bf got the Original Soft with Oreo pieces. It was mild in flavor, and less 'yogurty' compared to mine. I on the other hand like the tanginess, so I ordered the Original Tangy with Kiwi and Mango. I wanted something refreshing and it really hit the spot. One of our friends ordered a weekly flavor, topped it off with gummy bears, and then went nuts with the free toppings. Our other friend got the Original Soft (I believe) with raspberries and mandarin oranges. The boys were playing baseball checkers before we started eating. It's a great place to just hang out, listen to the music playing, and beat your friends at board games. We also played like 3 games of Boggle, lol. This place is great to just let loose. Its a fun atmosphere because of the music, games and 'Yogato Rules'. Its an affordable place that offers free toppings. Lastly it is great tasting frozen yogurt. Compared to ones I have tasted in the past, the flavors are overall less tangy and more creamy, which is better for fooling your brain into thinking this is ice cream. I love that all the flavors are non-fat and only 30 calories per ounce. If you're not in the mood to eat anything, they also offer drinks such as teas ($2), and customizable hot chocolate ($3). Hi Everyone! So the bf and I went on a double date with our college friends to Nando's Peri Peri in Dupont Circle. It is a newer location opened April 8th with the other location in Chinatown. I've never heard of this place before but apparently 'Nando's was born in 1987 in South Africa...From the humble beginnings, Nando's Restaurants have now opened in 34 countries on five continents around the world, launching in Washington DC in July 2008.' Recommended by our college friends we all decided to check out this World Famous restaurant known for its Portuguese flame-grilled chicken. The bf and I met them down in Dupont by taking the Red Line to Dupont Circle. Our friends parked on the street. There are meters around, however its always a bit of a pain to park in the city. The front has a huge window so you can see the interior and the gold door makes it feel like you're walking into a ultra-chic lounge. This is the the front room that can be seen through the window. I personally like the exposed brick, tall ceilings and cool artwork. The place has a nice contemporary feel. 1. Hostess shows you to your table that has a number on it. 2. Decide what you want from the menu and its spice level (we'll talk about that in a minute), remember your table number and order at the 1st floor registers. Utensils and fountain drinks can be obtained near there as well. 3. Go back to your table and your food will be brought to you. There is a tip jar at the register. There is even a waiting area for those that are ordering their meals to go. You can see and smell their flame-grilled chicken which is right behind the registers. On the counter there are bowls of nuts (free) and olives (not free, $3.75), which look really tempting when you're ordering. Sorry for the blurry pic, but its to show you that there are 2 floors to the restaurant, and we sat on the backside of the 2nd floor. Ok onto the flavor options. You can choose the spice level of your chicken from Mild (Lemon & Herb), Medium, Hot and Extra Hot. However if you ordered Lemon and Herb (like me) and felt you could have ordered something with a bit more kick, they have a ton of sauces that REALLLLLY makes this chicken special. They have all of the same flavors you can order on your chicken like Lemon & Herb, Medium, Hot, Extra Hot, plus Wild Herb and Garlic. This is what our dining room looked like with wine bottles covering the entire perimeter of the room. We were Table number #31. The sauces came out of nice glass bottles with a sort of liquor-dispensing nozzle. Now onto what we ordered! Since there were four of us we decided to get the '2 Whole Chickens + 4 Large Sides' for $42.45. It's a good deal since 1 whole chicken alone is $15.95. Our college friends ordered their chicken Extra Hot, and the bf and I shared a Lemon & Herb chicken. For our sides we ordered(all $3.95 if ordered separately), Garlic Bread, Fries, Portuguese Rice and Red Skin Mashed Potatoes. The food is really delicious. The chicken is tender and juicy. The mashed potatoes is buttery and smooth. The Portuguese rice has a good amount of salt in it to give it a burst of flavor. The fries were good like normal fries usually are. The Garlic Bread was so good and flavorful with a nice crunch. Everything is good on its own, but a bit more special with the sauces to dip the chicken or fries in. Another cool feature near the waiting area is a sink for you to wash your hands since the best way to eat the chicken is digging right in with your fingers. They've thought of everything! I loved this place. There's a ton of room for larger parties, and no hassle with splitting the check at the end of the night because everyone can order and pay on their own. The food is affordable, very flavorful and the atmosphere is really trendy, but its not a stuffy place. The staff was really helpful checking in on us and getting whatever we needed. They offer sandwiches, pitas, wraps and other non-meat items like a Veggie Burger and a Portobello Mushroom Burger, all of which don't cost more than $8. They also have a nice dessert menu with ice cream, cakes and frozen yogurt, which I'll have to try the next time I go there.